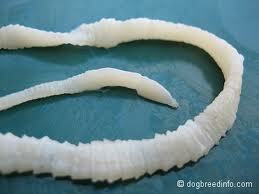 Tapeworm pictures in a dog. I'm wondering if what you are seeing are tapeworm segments. 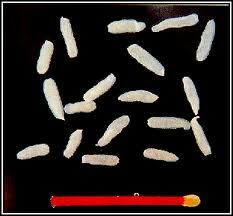 Tapeworm segments can look like a dried up piece of rice, or sunflower seeds. Or, if you catch them when they are fresh they can look bigger than either of those. If you live in the US, you can buy a Tapeworm Dewormer for Dogs without a prescription. But in some countries, like Canada you need to see your vet to get a dewormer that kills tapeworms. It is a great idea to have your vet do some stool sample tests to make sure that there is not some other type of parasite present.